MSELECT Academy is now offering internationally certified IT courses and exams in advanced MS Office Excel through Microsoft and Certiport. The Microsoft Office suite presents an exciting opportunity for managers, employees and job-seekers to improve desktop computing skills. With this software release comes Microsoft Office Specialist certification, a valuable credential that recognizes the skills needed to use the full features and functionality of advanced MS Office applications. The credential can be used to your advantage in a competitive environment by giving you the skills and expertise that employers depend on. Why is certification important for you? The need for Microsoft Office skills is increasing dramatically as more and more academic institutions and businesses are embracing newer technologies. Microsoft Office Specialist (MOS) certification will enable participants to advance academically and start their careers with proven MS Office skills. Based on globally recognized standards, MOS certification is an important and distinguished credential when applying for jobs or looking to move to the next step in your career. Now is your opportunity to deepen the substance and value of your IT skills, especially business and technology courses. 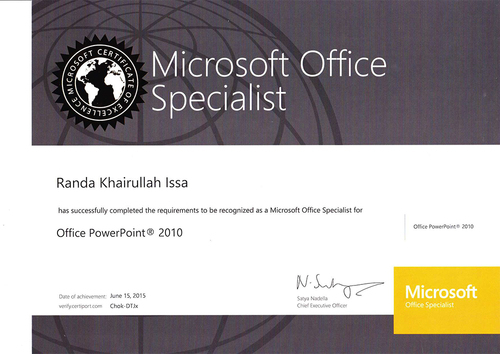 The Microsoft Office Specialist core certification validates skills with the Microsoft Office suite. 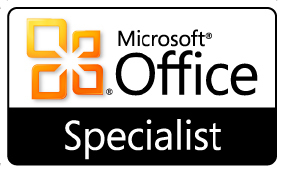 Exams are available on these MS Office products: Word, Excel®, PowerPoint®, Access®, Outlook®, SharePoint® and OneNote®. When are courses being offered? MSELECT is currently registering students for the upcoming Microsoft Excel – Specialist Level course which will start on Sunday, March 31st and continue to April 4th. The time of the classes is 9:00 AM to 3:00 PM. The cost will be $400 (special introductory rate) including the training sessions and preparation exam, plus the final certification exam. NOTE: College students will receive a discount - please call 077 261 75 794 for more information about this. Mr. Sarm Abbas is a Microsoft Office Specialist, certified Master Trainer with more than 15 years of experience in IT training. Known for his creative and engaging teaching style, Mr. Sarm has multiple advanced certifications from Microsoft, COMP TIA, Certiport, and ITIL. He is a native Kurdish speaker, and fluent in both Arabic and English languages. He has offered IT courses to major oil companies and international organizations in Erbil and Sulaimanyia.